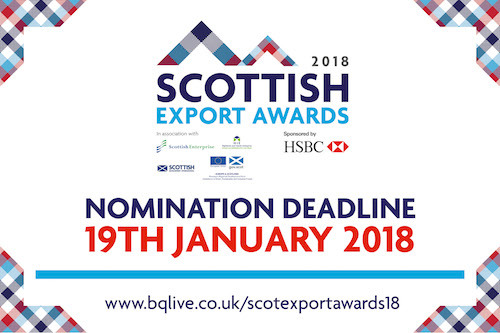 Nominations for the 2018 Scottish Export Awards, sponsored by HSBC in association with Scottish Enterprise & Highlands and Islands Enterprise, are now open. The Scottish Export Awards and International Trade Campaign brings together businesses from across Scotland to recognise and celebrate their entrepreneurial exporting achievements. Nominations open today, for businesses of all shapes and sizes, both exporters and export advisers, so don’t miss your chance to get involved. The nominations can be completed online here. The awards on offer range from micro exporter of the year all the way through to large exporter, e-commerce exporter, scale-up and entrepreneurial exporter of the year. The event will be held on 22 March 2018 at the Hilton Hotel Glasgow. The awards have proven extremely popular in previous years, are completely free to enter, and are a unique opportunity to build your brand profile, generate some good publicity and attract potential investors. Last year’s BQ Scottish Exporter of the Year award went to the large exporter prize winner, John McGavigan, the Glasgow plastics manufacturer which exports car components across the globe. BQ’s Bryan Hoare said: “It’s universally recognised now that export markets are crucial for the growth and development of the Scottish economy, and that Scotland has a booming international trade environment in which businesses are being nurtured. “We’re delighted to be supported by Scottish Enterprise, Highlands and islands Enterprise and HSBC who all recognise what a great platform these awards are for businesses to shout about their achievements. “This is your time to shine, to stand up and proudly proclaim that you are the very best that Scotland has to offer when it comes to exporting in your field. Alison McGregor, CEO of HSBC Scotland, said: “HSBC are delighted to be sponsoring the Scottish Export Awards for the third year running. Paul Lewis, managing director of Scottish Development International, added: “The Scottish Export Awards are a fantastic way for companies to celebrate and be recognised for their exporting achievements. “In recent years we’ve seen increasing numbers of exciting and innovative companies enter the awards and I would encourage any ambitious companies out there to take part this year. Full details on booking tickets, and the remaining sponsorship opportunities, are here.